Samsung’s Galaxy S series over the years are the devices that most people associate with flagship Android experience. The company has been a constant in the mobile landscape while we’ve seen other players, either successfully or unsuccessfully, attempt to dethrone the Korean chaebol’s position in the market. Being at the top also means that there’s a lot to lose, so risk aversion is encoded into the Galaxy S’s series’ DNA over the generations. For Samsung to execute well, it needed to devise a plan to make the S9 attractive to consumers. This comes at a time where Apple sees a great reinvigoration of success through the new iPhone X which drastically changes the competitive landscape, so playing it safe might not be the best route for success for Samsung every single time. 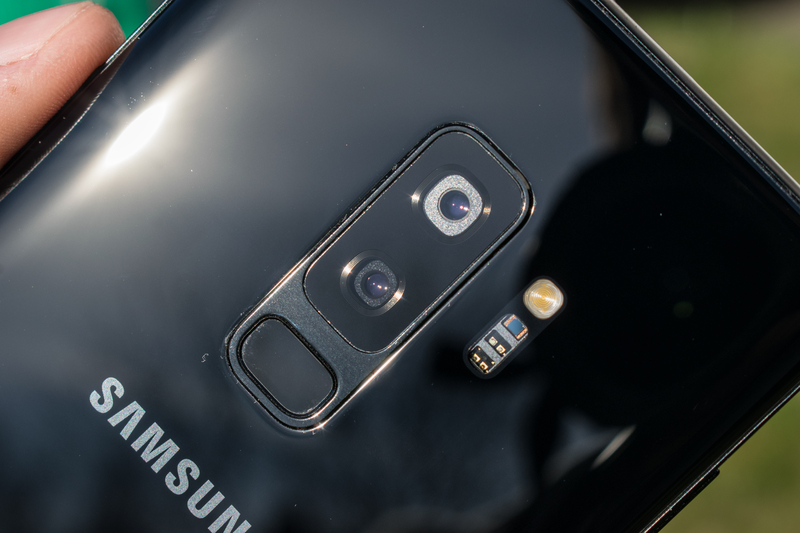 In this review we’ll be posting extensive coverage of the two biggest stories surrounding the Galaxy S9: its camera and its new SoCs. We’ll dwell deep into the picture quality of the new unit and do a wide comparison against today’s most popular flagships. The central processors, the Snapdragon 845 for the US/China/Japan, and the Exynos 9810 for most of the rest of the world, are at the heart of the phone and a key element to how the device feels and performs. We’ll be having an extensive in-depth look into their performances and attempt to explain how they tick. The Galaxy S9 is a device which fully embraces the saying of “If it ain’t broke, don’t fix it”. 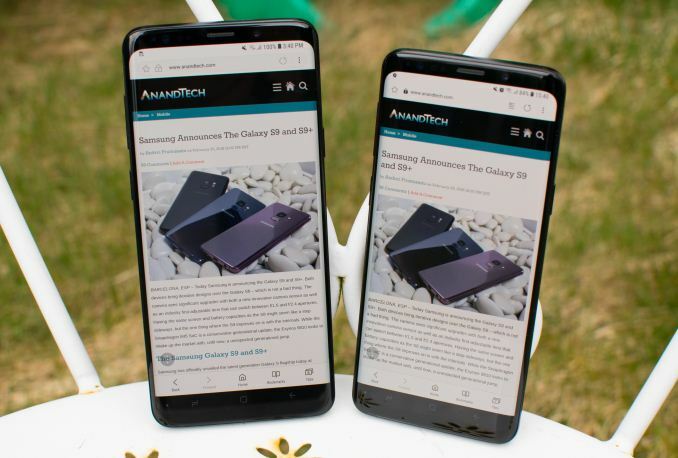 This year’s Galaxy S is a generation of refinement rather than one of big changes, and to see the differences between the Galaxy S8 and Galaxy S9, we have to look into the details. Starting off with a quick talk about the hardware specifications, we see Samsung’s mobile division continue the trend of dual-sourcing SoCs. American, Chinese and Japanese markets will receive Qualcomm Snapdragon 845 powered phones, while European and other markets will receive Samsung LSI’s Exynos 9810 silicon. For what our testing in this review will show, this year will see huge differences between the two SoC variants so we’ll focus in-depth on the details and effect this has on the overall product experience between the two versions over the next several pages of the review. 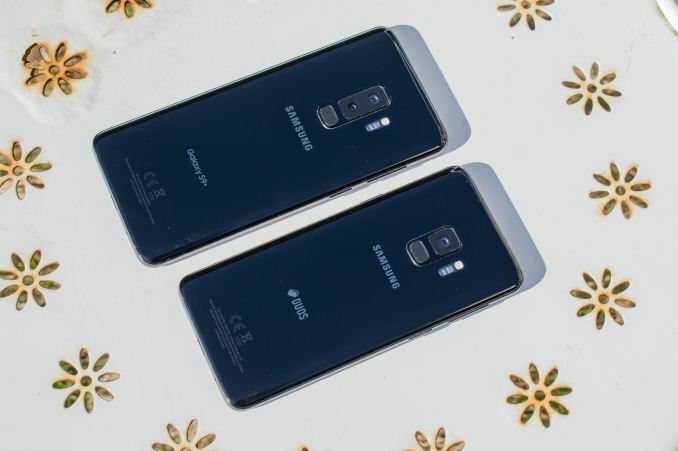 The Galaxy S9 continues the trend of coming in a “regular” form-factor, joined by its larger sibling. dubbed the Galaxy S9+. Ever since the introduction of wider aspect ratio screens by various vendors last year, it’s become quite unintuitive to talk about smartphone sizes in terms of screen diagonal. The Galaxy S9 comes with a 5.8” screen, however much like the Galaxy S8 last year it fits a “regular” footprint with a 68.5mm body width. The Galaxy S9+ with its 6.2” screen fits within a 73.6mm body width, remaining more compact than other large variants of phones such as the iPhone 6/7/8 Plus, LG V30, the Pixel 2 XL, or others. Both the Galaxy S9 and S9+ shaved off respectively 1.5 and 2mm off the vertical height, however this reduction in footprint came through flattening of the rounder frame of the Galaxy S8 rather than a reduction of the front faces of the phones. The larger Galaxy S9+ houses a 16% bigger battery, coming in at 3500mAh/13.47Wh advertised capacity, versus 3000mAh/11.55Wh for the Galaxy S9. 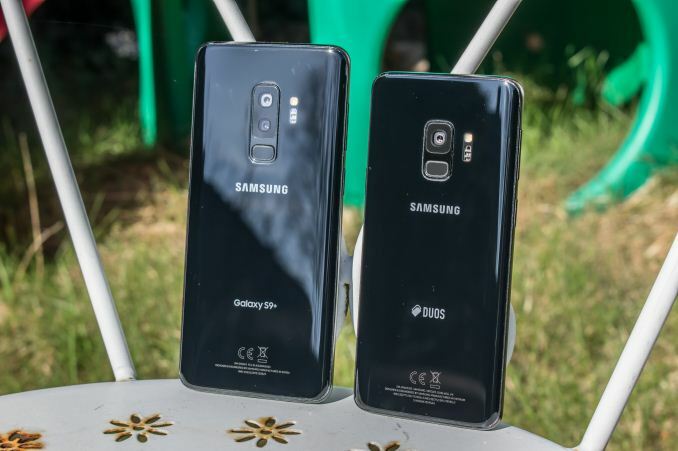 This year in particular we’re seeing a greater number of differences between the regular S9 and S9+ as Samsung opted to give the bigger variant a fixed 6GB RAM configuration, while the regular variant remains at 4GB like last year’s Galaxy S8’s. I haven’t seen an immediate need for the larger RAM configuration, as in my short time with that model I saw well over constant 2.5GB of unused memory in every-day usage. The biggest feature discrepancy between the Galaxy S9 and S9+ however is the addition of a telephoto lens on the S9+. As I talked about this in our announcement article, I’m not a big fan of this feature disparity between size variants as it was first introduced by Apple in the iPhone 7 Plus – personally I vastly prefer the smaller form-factor but I feel left out not having the option of the second camera. The new main camera on the rear has seen immense upgrades both on the sensor side as well as the optics of the module. The new sensor includes a new tri-stack design including the CMOS array, the integrated ISP, as well as now a dedicated DRAM die, all integrated with each other on the same silicon package thanks to the use of through-silicon vias (TSVs). This new design allows – among other things – 960fps video capture, as well as fast sequential image capture. The sensor is still a 12MP piece and employs 1.4µm pixels for low-light sensitivity. The optics of the new module includes a dual-aperture system that is able to switch between the native F/1.5 aperture of the lens assembly and a reduced aperture of F/2.4 for brighter situations. The new lens system promises the benefits of great low-light photography while avoiding the issues of the shallower depth of field of the native optics system when switching to F/2.4. With Samsung’s marketing making a great deal of noise around the new camera, we’ll be focusing ourselves in-depth onto the subject and shed some light on the matter with an extensive exposure across a dozen recent flagship devices later in the review. Still on the back of the phone we see more changes to the layout around the camera. First off the fingerprint sensor is no longer alongside the camera – where we now once again find the flash and biometric sensors – but rather is underneath the cameras. Instead of two cut-outs like on the S8, the S9 only comes with a single large one that houses both the cameras and the fingerprint sensor; this is the most distinct change in feel between the S8 and S9 as the edge of the metal edge of the camera/fingerprint housing is sharper than the more smooth back of the S8. Personally I liked the side positioning of the S8 a lot more, as on the regular S9 the fingerprint sensor feels too low now compared to where you rest your thumb on the power button. On the S9+ I might see benefit of the new positioning, but again this is something subjective to most people. The LED flash for the first time for Samsung now actually includes a circular light diffuser. It took Samsung 9 years to integrate one but finally here we are and the result is a smoother and less square illumination while only losing 5% in measured brightness. Among other minute design changes of the Galaxy S9 versus last year’s S8 are the button designs and placements. The S9’s buttons are seemingly more tapered off and thus feel wider and less sharp than the S8’s. They also feel to be clickier and have more travel distance to them than on the S8, something that’s especially felt on the power button. The power button as well as the Bixby button have gained 3mm in length, making them easier to press. Samsung has also moved all buttons upwards by a couple millimetres, something that I hadn’t noticed at all at MWC or in my first days with the device. I can’t tell if the new position is beneficial or not, but looking at it again it does look like my thumb rests more centred on the power button than on the S8, which might be one of the reasons in the ergonomics change. Another large functional change that isn’t directly visible but definitely audible is the new speaker system. 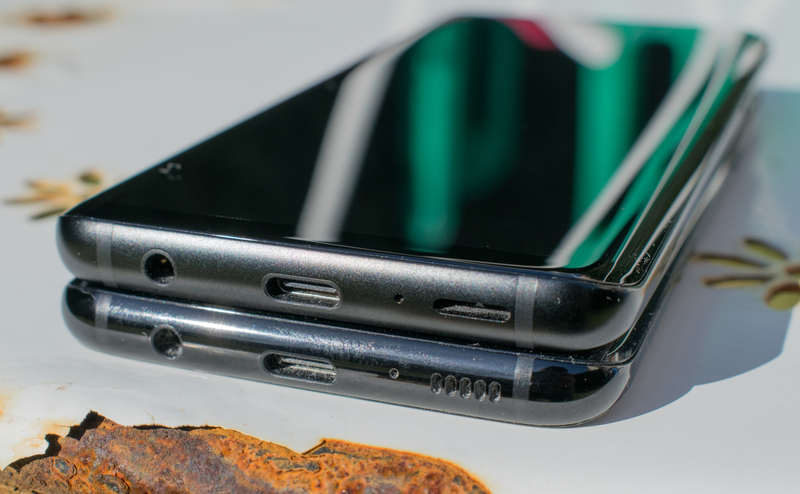 Externally the only thing that has changed from the S8 is the speaker no longer has a speaker grill in front of it but rather a continuous open slot onto a slanted membrane that protects the speaker chamber from water and dust intrusion. The S9 and S9+ now also feature stereo speaker functionality as the upgraded 2mm wider earpiece grill will now also output media audio alongside the main bottom speaker. I did a quick audio spectrum measurement of the S9’s output and you can see that the peak output at higher frequencies is 6 to 12dB higher than on the S8, while simultaniously losing some 10dB in the lower mid-ranges. In practice the S9 doesn’t seem to sound much louder, however the sound is immediately noticeable as a lot fuller and wider range than most other smartphones, including the latest iPhones and the Pixel 2’s. Finally the last externally visible difference between the S8 and S9 is that now the iris sensor on top of the phone is now hidden and no longer requires a transparent cut-out in the front glass. If the bottom speaker slot doesn’t expose the phone as an S9 then the inclusion of only one instead of two visible sensors at the top will discern it from a regular S8. In terms of design, Samsung clearly focused on iterating and perfecting on the S8. The S9 keeps an extremely attractive design. The most notable in-hand feel change is the flattening of the side frames and the rear fingerprint assembly. Personally again, I’m still not too sure which one I prefer. There may be other practical considerations for the S9’s industrial design changes such as improved durability when dropping the phone on its sides. Overall I still think overall that the S9 is one of the most ergonomic and comfortable phones to hold – something Samsung’s designers will have a very tough time with iterating in the future, for better or worse. The Samsung Galaxy S series have been over the years the flagship devices that lead the introduction of new SoCs. This generation the Galaxy S9 and S9+ come as among the first commercial devices with Qualcomm’s Snapdragon 845 and S.LSI’s Exynos 9810. Part of the focus point of this article is a deep look into the characteristics of both these SoCs and see if Qualcomm’s and Samsung LSI’s projections in performance and power bear fruit.